Mulligan for Dauphin Island golf course? MOBILE, Alabama -- When word spread that the Dauphin Island Property Owners Association voted to close the town’s golf course because of money troubles, more than 50 people gathered a few days later and developed a plan to re-open the course using volunteers. With an unpaid staff to maintain the grounds and nearly everything else, the 18-hole course will reopen Thursday, a town spokesman said. 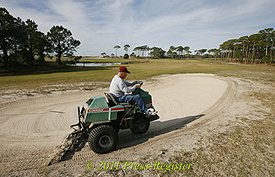 Since Dec. 20, more than a dozen residents and property owners have spent their mornings mowing grass and learning the ins-and-outs of operating and maintaining the barrier island’s lone golf course, said volunteer Jim Hall. Plans call for the Isle Dauphine to be open five days a week, Wednesday through Sunday, for at least three months, Hall said. A restaurant on the property, the Gulfview Grill, also will be open for breakfast and lunch on the same days. Jack Gaines II, president of the Dauphin Island Property Owners Association, said in a written statement that there could be some financial assistance to hire a new manager and staff a few months down the road. Dauphin Island Mayor Jeff Collier, who served as the Isle Dauphine’s golf professional and more recently as its manager, was told in mid-December his employment there would end Jan. 31. In an interview earlier this month announcing the golf course closure, Gaines said the course had failed to turn a profit, typically losing about $150,000 a year. The property owners association, which receives dues on a voluntary basis, Gaines said, was able to offset the loss for a while with money earned from royalties on a trust fund. Those funds have also declined in recent years. The public course opened in 1960. When asked who would be responsible for the day-to-day operations of the course, Hall said it would be Gaines because he is president of the property owners association. Gaines did not immediately return phone calls and emails requesting more information about how the course will be operated. Plans call for opening the swimming pool and beach access in the spring, Gaines has said.